Do you want to Zoom™? 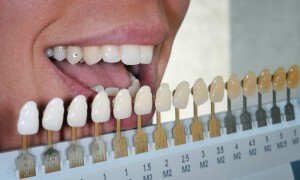 The zoom at our Gainesville dental office is a revolutionary teeth whitening system that is safe, effective and fast. In just over an hour your teeth will be whiter and brighter than your original nature shade. The Zoom tooth whitening system is trouble-free and painless. It begins with custom trays being made just for you. Then a proprietary Zoom whitening gel is applied. Your teeth typically become 3-5 shades whiter in an hour. We have found that for the best results that you continue to whiten with your custom trays for 1- 2 weeks at your convenience. This will give you total control on your teeth whitening experience. The Zoom whitening gel is a scientifically formulated pH balanced Hydrogen Peroxide that gently penetrates the teeth to remove deep stains and discoloration. With proper care and occasional touch-up at home, your whiter, brighter smile will sparkle for years. For a complimentary tooth whitening consultation, call or email us today to schedule an appointment with Dr. Weber in Gainesville, GA.